The best decisions are based on a consideration of evidence and an honest and deep reflection on our feelings, fears and needs. When discussing doulas and many other choices in birth, I hear a lot of reasons why couples will NOT have a doula or choose birth preparation or labour options that could be positive and helpful like hypnosis, meditation or water birth. Just like my reasoning above, often these decisions are not based on research or a true consideration of the couple’s feelings, fears and needs. Perhaps they are based on misconceptions or fears like mine were. When we dig deeper and look beneath the surface level reasons we have the opportunity to learn a whole lot more about what we are really frightened of, worried about, and any unspoken needs or expectations we may have. Then we are in the position to make really good decisions. Here are four common reasons people give for deciding to not have a doula. You may find this a useful discussion if you and your partner are considering having a doula and some of these concerns have come up. Find out about student doulas who may work for free or a minimal cost because they wish to gain experience yet may be very well suited to supporting you. While they may not have as much experience, you will benefit from their passion, commitment and up to date knowledge and they will often have an experienced doula as a mentor. Find out about doulas who offer flexible payments or low fees for low-income families. Many doulas will accept payments throughout your pregnancy and post birth. So, if you have not asked several local doulas what they charge and what are their options for payment, then you can’t honestly say “it’s too expensive”. You don’t know until you ask! How much is birth support during this important transition worth? What is the value of a relaxed, safe, positive beginning for you and your baby? Or the value of feeling well supported throughout pregnancy and birth? And a confronting question: how will you feel if a shattering, traumatic birth could have been avoided if you had a doula by your side? If you are birthing in a hospital maternity ward, then most of the people you come into contact with will be strangers. If you have a private obstetrician, the midwives will probably be unfamiliar and your obstetrician often won’t be there until the last few minutes of your baby’s birth. If you had a team of midwives for antenatal care, you may not get a midwife you are familiar and comfortable with during labour. You may have several midwives as their shifts change during your labour. If a paediatrician, anaesthetist or registrar is needed, they will usually be a stranger too. You will come across a lot of strangers during your labour and the days afterwards in the maternity ward. If you don’t want strangers at your birth then think seriously about where you are giving birth and who you are allowing into your birth space. Consider adding someone familiar to your birth team who will protect you from the impact of these strangers. A doula is someone you choose to get to know, become comfortable with, and have with you during labour and after birth. You will meet your doula many times before birth to get to know each other and feel comfortable. If you choose the right doula for you then she will not feel like a stranger. Through all the shift changes and different people you may meet, she will be a familiar and friendly support person coming along with you. Everyone else might be strangers but a doula will be one person you do know apart from your partner. Is thinking of a doula as a “stranger” really valid? Am I (or is my partner) afraid of having a doula there? What is it that makes us uncomfortable about this idea? And what does this teach us about our needs for birth? Are we meeting these needs in our other birth plans? You deserve the best support around! The more supported, safe and comfortable you feel, the easier it will be to birth your baby. Why not have as much support and help from respectful, educated, professional, experienced people as you can get? Even couples who have prepared as well as they could for labour can end up feeling lost, alone and overwhelmed. Chrissy Grainger (Birth Journeys contributor and doula) explains that she became a doula because “I previously coordinated a support group for pregnancy and birth and was seeing so, so many women have all the information and support during pregnancy, [only] for the birth to go pear shaped.” Continuous support during birth was what was missing for many of these women. Unless you have continuity of care with one midwife, and you are her only birthing mother at the time, your midwife will not be there with you all the time. If you have continuous monitoring or a IV drip set up then there will be people checking up on you often – but they may be focused on measurements and machines rather than supporting you. Hours of labouring can become stressful for even the most prepared couples when you are uncertain how things are going, what is normal, what is going to happen next and how much longer it will be before your baby is here. Why don’t we need support? Are we expecting support from other people (eg, a relative, friend, midwife, doctor) and will they be able to meet our expectations? Or, why don’t we want support and what does this teach us about what we are wanting from this birth? Are we trying to prove we can do it by ourselves, and if so, why? Are we are seeking an intimate, personal experience of birth, and if so could a doula help to preserve and protect this? There are many different doulas and they each have a different personality, a different age and stage in life, a different relationship to offer you. It seems very unlikely that any doula would tell you what to do, make you feel like a child, or take ownership out of your hands, especially if you tell her that you do not want to feel like that. Doulas want to support women to take ownership of their own births. It is more likely that if you choose the right doula for you, she will protect and preserve your birth space, your rights and your needs. 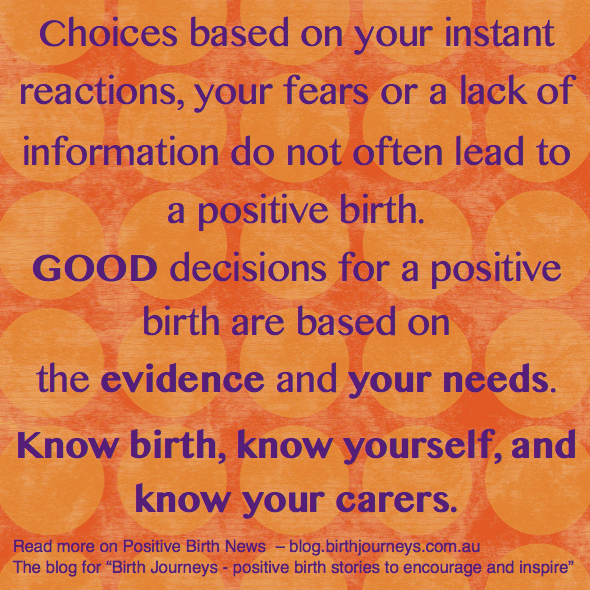 A doula knows that birth is not about her – it is about you, your partner and your baby. On the other hand, there may be other health professionals in a hospital, birth centre, or child health clinic who may “mother” you and make you feel as though you have been placed in the role of a child. There may be others who will tell you what to do without honouring your ownership of this birth, or your motherhood of your child. A doula can help to protect and cushion you from the impact of these interactions and reaffirm that you, your baby and your partner are at the centre of this birth. What would an ideal birth support person be like for me? Would it be beneficial to have my kind of support? Am I worried that letting someone in to support me will take away my power? Categories: Birth Information, Birth preparation, Opinion | Tags: birth ownership, birth support, cost, doula, good decisions, making decisions, mothering the mother, stranger | Permalink.